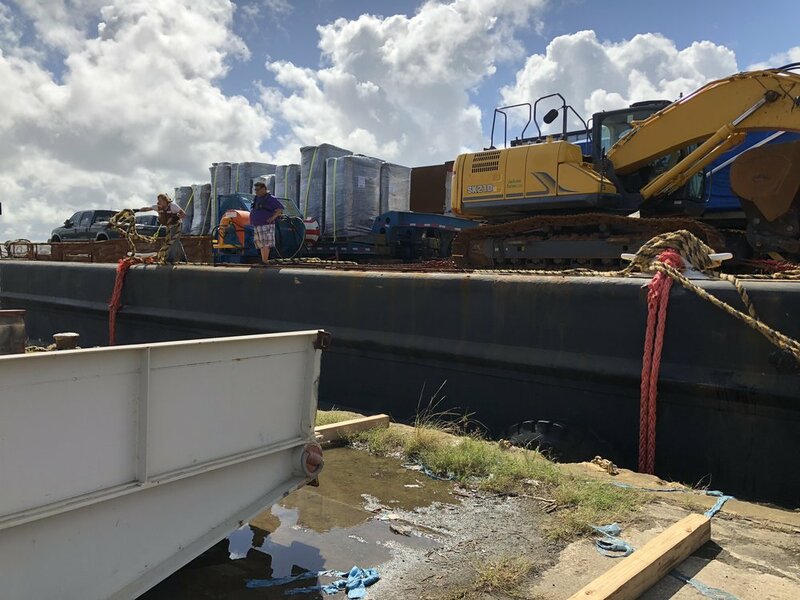 Relief cargo for Puerto Rico, because of the Jones Act, has to come in on U.S. flag ships (when moving between two U.S. ports). Many vessels have joined in to help bring this cargo and the "Capt. Willie Landers" is one of them. She has been making regular voyages and right now she is in Virginia loading a fleet of electrical utility trucks that came from Dominion Energy in Richmond. This company has a rich history of charitable contributions and volunteer service and when Capt. Willie Landers arrives in January with their cargo I will post more information about that voyage. Large steel ramp is positioned an the starboard side so the cargo can be rolled off. The relief cargo on this voyage was put together by a combination of charities. The trucks and the two amazing large wood chippers are under Al Debolin's company "Migo IQ". 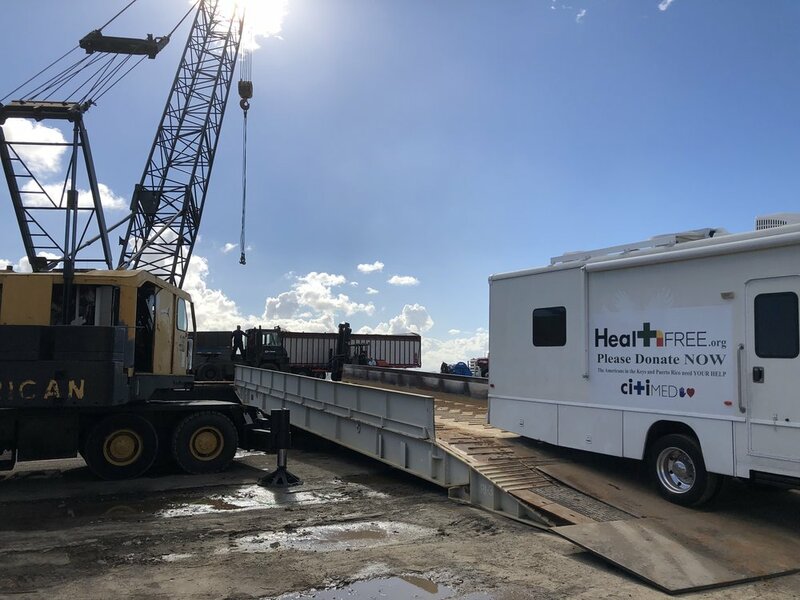 The Coalition of Hope Foundation brought a large medical trailer and "CSI" - Compassion Services International is in charge of a relief project with large water purifiers and other emergency supplies. Coalition of Hope medical trailer. 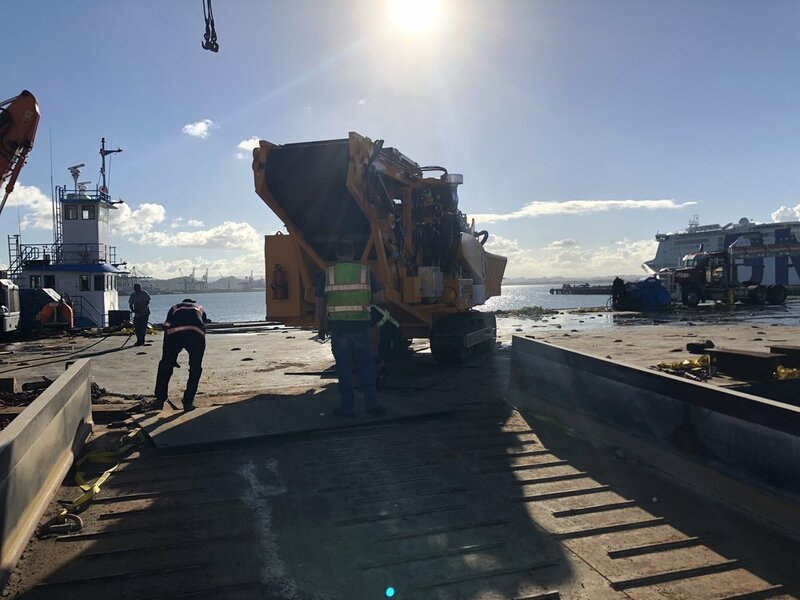 This is a conveyer loading wood chipper which "migo IQ" will use to help clean of all the hurricane refuse from the sides of our roads. The deck of the large barge is nearly empty after we have unloaded all the cargo. 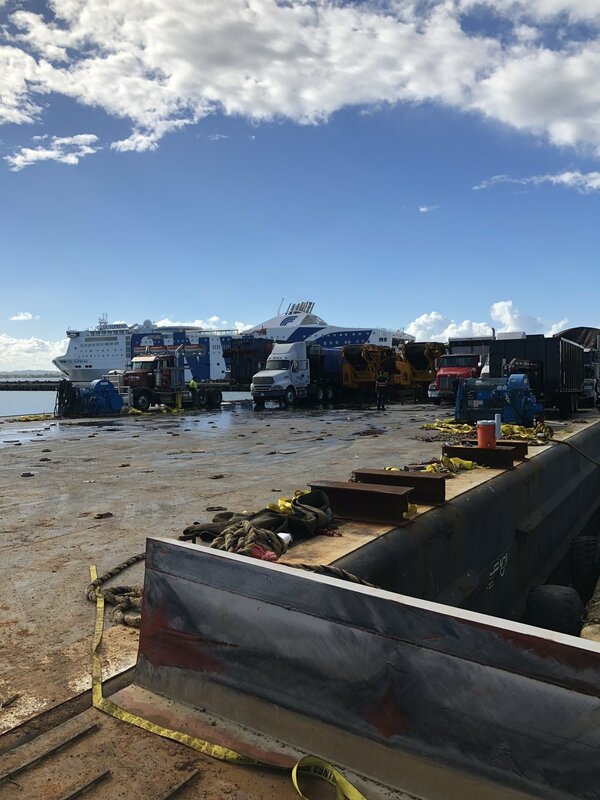 The stevedores from Transcaribbean Maritime made quick work out of unloading the vessel. 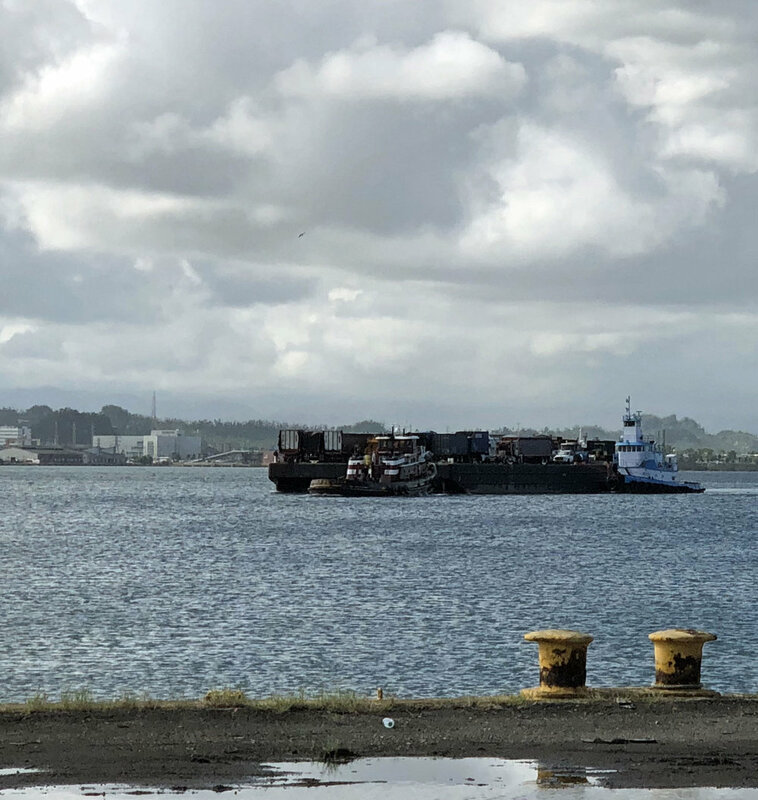 Because there are so many ships coming into San Juan with relief cargo our space at the dock was only hours long but luckily the stevedores could completely unload the vessel in only six hours. 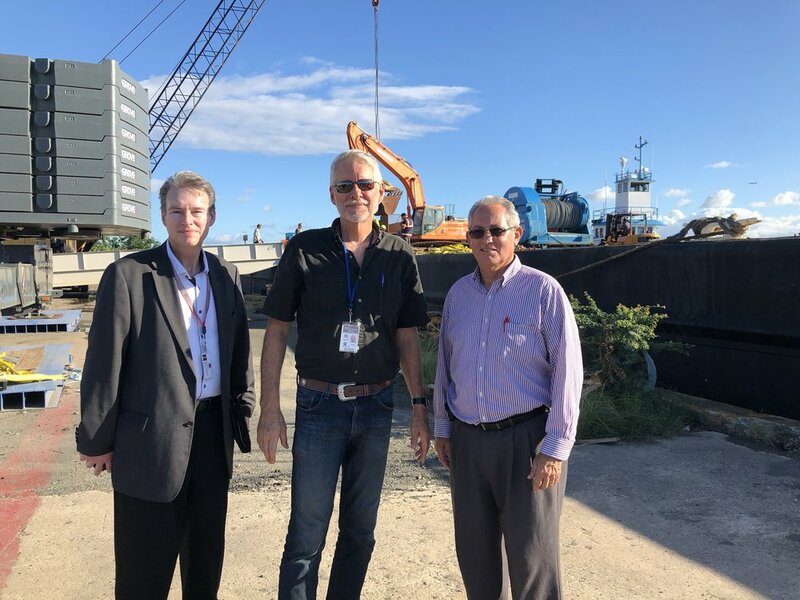 I'm standing between Compassion Services director Robert Rodenbush and local pastor Les Piercell who were instrumental in putting all the cargo together for this relief voyage.